Codes precision estimated for PBE exchange-correlation functional on the database of molecular systems from http://www.cse.anl.gov/OldCHMwebsiteContent/compmat/G2-97.htm Single-point energy calculations performed at “MP2(full)/6-31G* geometries”. Energies in eV, geometries in Angstrom. See gpaw/test/big/g2_1/pbe_nwchem_def2_qzvppd_analyse.py and gpaw/test/big/g2_1/pbe_nwchem_def2_qzvppd_opt_analyse.py for NWCHEM calculated results. Atomization energies on relaxed geometries vs Gaussian. 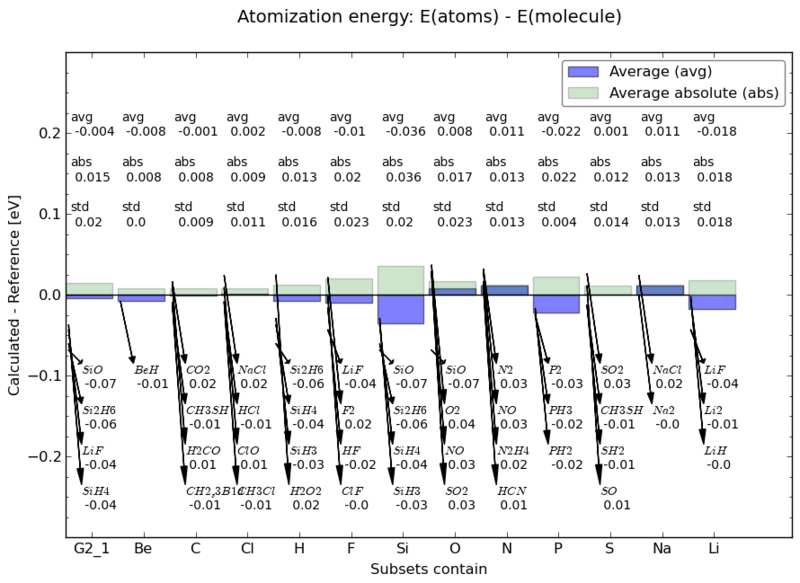 Optimized distance between the first and last atom in the given molecule vs Gaussian.